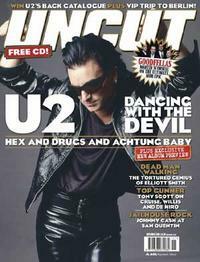 Uncut magazine’s November issue features a U2 special, with an interview with Bono. The special looks back at the band’s transformation from ‘earnest musos to manic cyber-rockers’. Uncut investigates the darker side of the band and the circumstances surrounding the making of Achtung Baby. As a bonus, the issue includes a track by track preview of the new album and a competition with a chance to win a trip to Berlin. Uncut is a U.K. publication.